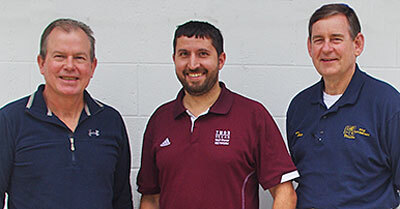 Responsible for presenting the program was, left, Tim Logan, FOR Environmental Committee Chair; Ryan Gerlich, speaker, Texas A&M AgriLife Extension; and Tom Ronayne, FOR Director and program co-ordinator. The first in a year-long series of FOR Environmental Committee public education programs was the “Introduction to Onsite Wastewater Treatment” on Sat Mar 3, at the FOR Community Center. Speaker Ryan Gerlich gave a two hour fact-filled presentation about types of wastewater treatment systems available to the homeowner and their operation and maintenance. The first step in making sure your on-site wastewater treatment system, whether septic tank or aerobic, functions properly, is to choose the most appropriate technology for the site. By law, wastewater cannot leave the property where it is generated and homeowners are responsible for maintenance of the system. Before building, altering, extending or operating an on-site sewage facility, other than emergency repair of existing systems, a person must have a permit and approved plans from the TCEQ or its authorized agent. The San Bernard River Watershed Protection Plan cites failed septic systems as a contributor to occasional elevated bacteria levels in the river. Addressing substandard systems will help ensure our river remains a clean place for us to fish and play. Grant money from TCEQ or H-GAC may become available after September of this year for homeowners who can’t afford to bring their system up to standards. We will publish information on the application process for the funds as soon as it is available next fall. 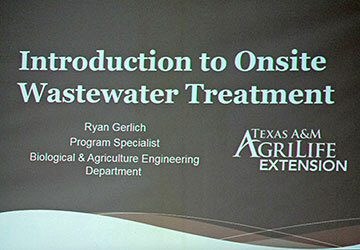 For more information and publications go to the Texas A&M Agrilife Extension website “On-Site Sewage Facilities (OSSF)”.